There is a tradition, it could be ancient or it could be neopagan, that at Samhain, which is this week, one lights a ritual fire and casts upon it that which you would be rid of. When a friend reminded me of this, I immediately thought of our new neighbour’s Saltire, which flaps over the gardens driving away the birds. A curse written on a piece of paper should do the trick. But what if the next time I saw the flag, it was in tatters? What if it wasn’t? I didn’t like the idea of either possibility so decided that witchcraft is best left to others. [But see note below!]. Of course, I could be more philosophical and cast upon the fire my neighbour’s desire to belong to a clan. Or mine, come to that. But that seemed a bit limp. We’ve been clearing out a lot recently, sold stuff on eBay, given it away on Freecycle, taken three loads to the dump. 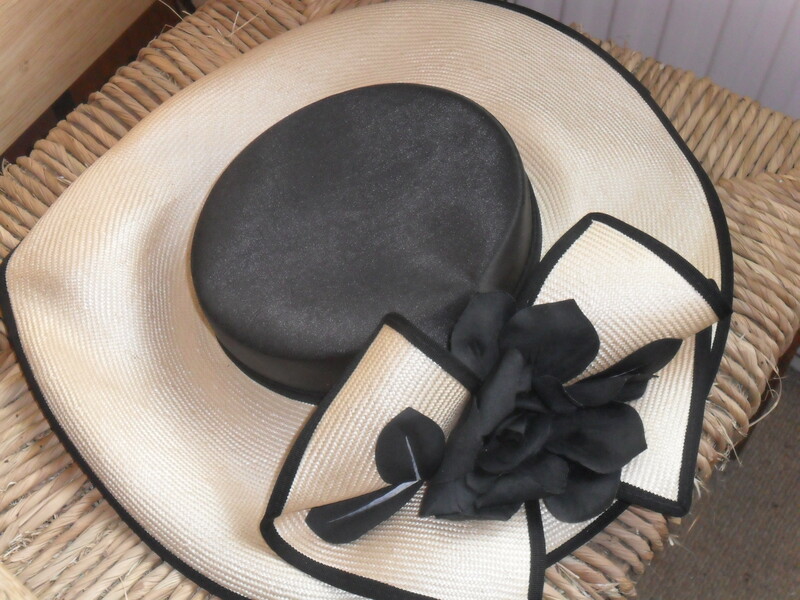 There’s much more to go and amongst it a certain hat. Catching a glimpse of it yesterday in the heap, I knew it was to be my Samhain offering. When my father died, I got fired by a strange energy and was definitely not myself. The idea that has since taken root that I’m no good at organising funerals began then, when I arranged for it to take place in the local church, even though my father had no time for religion (he was deep, he was spiritual, but he never went voluntarily to church). I went out in the morning to buy an appropriate hat, which I found in Debenhams. Having spent a small fortune on something I knew I’d never wear twice, I was going out of the store when I was offered a make-over, which I was high enough to accept. Who on earth did I think I was? My dear, humble dad being buried by his plain-jane daughter, in a swanky coffin in a church and her dressed up to the nines and with a plastic face. Every time I see that hat, I wonder what possessed me. I shall wonder no more. On Thursday, the day when my dear old greenhouse goes to make way for something bigger, I’m going to light a bonfire on the allotment and cast the hat into the flames to mark the moment when I declutter my life of parents. I don’t mean that to sound brutal, but I don’t have to keep everything that was theirs, only a couple of photos and some real treasures. After all, it won’t be long before someone else is having to clear up after me, and the less I leave them the better. All Souls is the time to remember and honour the ancestors. Let memories be stored in the heart, not the attic! After all, the heart we take with us. Note. I wrote this in draft on Sunday. Yesterday the Saltire disappeared. Whether it was our neighbour taking it out of harm’s way, or the 90 mph winds that took the country by storm, I don’t know. But it’s gone, and may be I have powers best left untapped. The recent death of that lovely man, Famous Seamus, brought forth a groan from the British and Irish alike. He belonged to us all. For some reason I was channel hopping mid-morning the day of his funeral and the BBC were showing the service in Dublin in real time, no commentary, just background shuffling and coughing and then the address by the priest. I felt like I’d gate-crashed a family affair, found myself at a funeral with a mug of coffee in my hand, and didn’t stay too long, just long enough to listen to the moving eulogy. Royalty had died for sure, and there was a new poet in the great Library above. I love it when those who reach the highest rung of the literary – or any – ladder deserve it. Heaney was a hero. To mark the passing the BBC made Beowulf the Book of the Week this week (and perhaps last, too, on a different scheduling – I kept picking up different episodes in apparently random order while I did the ironing or made bread). Beowulf is something I’ve struggled to connect with over the years. I bought the Heaney translation as a last ditch attempt to get into it, but it has sat in the unread pile ever since. Suddenly I was moved to blow the dust off it, to seek out episode 1 on iPlayer, and to read and listen simultaneously. I only just caught episode 1 – there was one hour left to listen. I left episode 2 too long and it had vaporised before I remembered – but since then I’ve been doing accelerated catch-up to make sure I don’t miss any more. I must press on and catch up on episodes 6 to 8 today and perhaps also cram in another viewing of Michael Wood’s Beowulf that never got deleted from the hard drive. Expect more dreams tonight? Hope so! Thanks to Seamus, I’ve got the rhythm and lilt of the earliest English poetry pulsing in my veins. 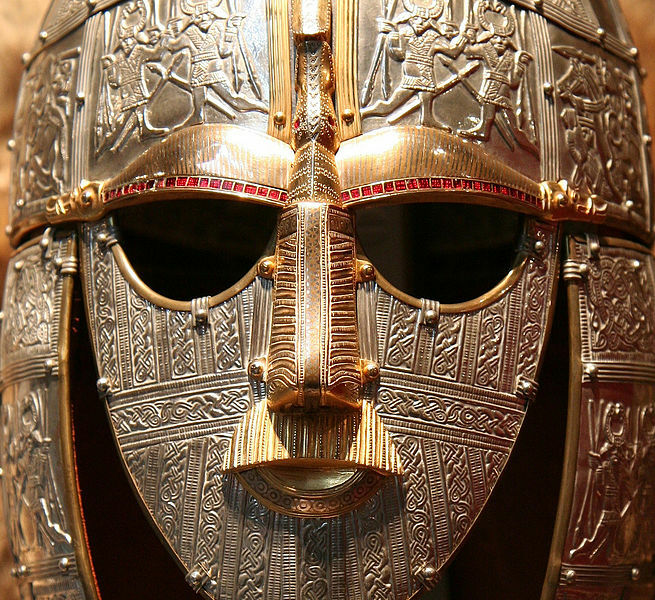 It’s as if I’m an Anglo Saxon in my sleep, haunting great halls decked with golden treasures – clasps and hilts of inlaid garnet wreathed with serpents, sorry, that is to say, ‘worm-wreathed’. When we write by hand, we make a unique imprint of ourselves upon the world. This statement in an article in the latest edition of New View* brought me up short. 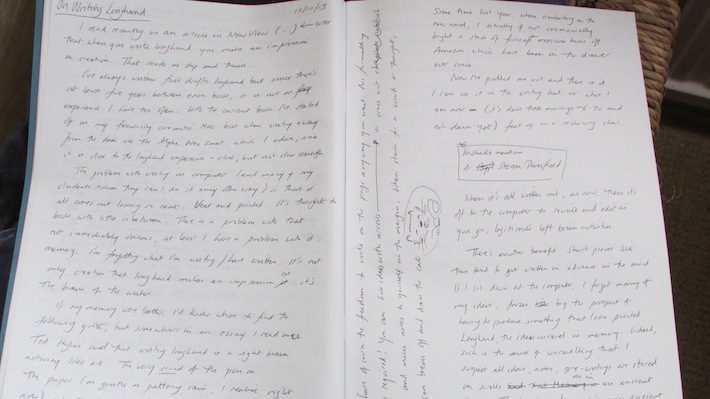 I’ve always written first drafts longhand but since there’s at least five years between each book, it’s not an experience I have too often. With shorter pieces I tend to write now straight to screen. If at my desk, it’s on my fabulously cinematic Mac but when away from the desk I’ll use the Alphasmart Neo, which I adore, since it is close to the longhand experience (all keyboard, very little screen, can’t edit as you go), close but not close enough. Real longhand is when a pen or pencil pushes into paper. When you can hear it, feel it, smell it and, if inclined, taste it. The problem with writing on the computer is that it all comes out looking so neat. Neat as print. It is thought-to-book with little in between. There is a problem with that, not immediately obvious, at least I have a problem with it: memory. I’m forgetting what I’m writing/have written. It’s not only creation that longhand makes an impression on, it’s the brain of the writer. 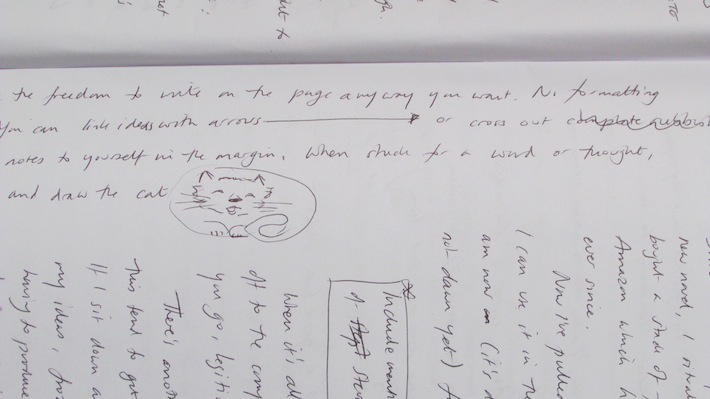 If my memory were better, I’d know where to find the following quote, but somewhere in an essay Ted Hughes says that writing longhand is a right-brain activity like art. The very sound of the pen on paper, as gentle as pattering rain, activates the right hemisphere. Some time last year, when embarking on my current project, I ritually if not ceremonially bought a stack of school exercise books off Amazon which have been in the drawer ever since. Now I’ve pulled one out and am half-way through it. I can use it in the writing hut or, given the season, somewhere more cosy indoors. When it’s all written out, as now, then it’s off to the computer to rewrite and edit as you go, legitimate left brain activities. You have the freedom to write on the page any way you want. No formatting skills required! You can link ideas with long arrows or cross out errors and make notes to yourself in the margin. When stuck for a word or thought, you can break off and draw the cat. Because of that creative freedom, the ideas are better when you write longhand. There’s another benefit. Short pieces like this tend to get written in advance in the mind, usually while the rest of me is asleep. If I sit down at the computer, I forget many of the ideas that were bubbling up over night; suddenly the brain is frozen by the prospect of having to produce something that looks printed. Writing longhand, the ideas unravel in memory. Indeed, such is the sense of unravelling that I suspect all ideas, notes, pre-writings are stored on scrolls, as in an ancient library and that’s what Memory is – an ancient library, not a database. *’Mysteries of the Written Word’ by Richard Bunzl, New View, Summer 2013. 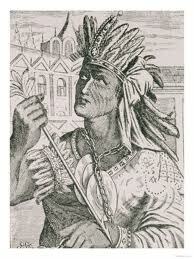 Our land is sacred, as the Native Americans taught us and the ancient Britons believed. Once it was peppered with holy places: hills, caves, groves, pits and shafts, but the most common were watery places such as wells, springs, rivers and lakes. The presiding deity varied from place to place. I don’t think the ancient Britons equated one with another as the Romans did, saying ‘What you call Minerva we call Sulis.’ Instead they respected each genius as unique to that place. In this year of exploring southern Britain, mostly sites along the Fosse Way but also further afield, I’ve been to the wells and streams, baths and springs of Sulis, Coventina, Cuda and many others now nameless. Now I’m not a full-blown Romantic who can sit down in a sublime landscape and commune with the spirits. At least half of me is of a sceptical bent (it leads to some interesting inner conflicts). However, when I catch myself poo-poohing the concept of elementals, I remind myself that I met one once, and the contact bestowed (bestowed, note, not gifted!) what writing talent I have. But that’s another story. This post is about genii, not elementals. Shakespeare knew his fairies and spirits. 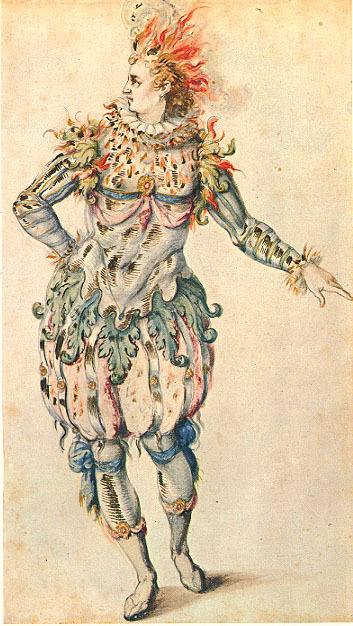 In A Midsummer Night’s Dream, Mustard Seed, Cobweb and the rest are elementals, but Titania and Oberon – they are genii, spirits of the place. I know what a genius loci looks like, but I’m not sure how. In my mind there is an image inspired by votive altars and other less expected sources such as a contemporary drawing of an Inca chief and designs by Inigo Jones for a masque. So, this is how he looks: he has a mural crown (that is, one that is tall and encircles the head, called ‘mural’ because Cybele wore walled cities on her head), and carries a sheaf of corn, a rolled parchment or a sceptre. He is bare to the waist and then skirted. The Inca chief is only close, in that he wears a mural crown of feathers and bears an arrow, but perhaps ideas for costume amongst natural peoples, as well as ideas for costumes for masque designers, are fed to us from the Otherworld, which is why someone who is particularly clever is called a ‘genius’. It does not mean, and should never mean, someone who thinks up something original, so much as someone who divines a truth by mysterious means (I think Einstein would agree with this). Female spirits also have a form that is strangely familiar. 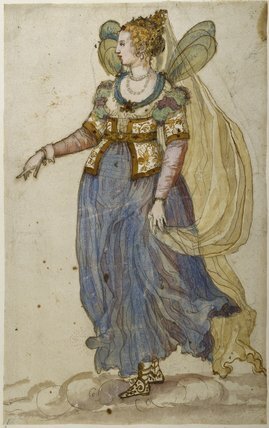 Lady masquer by Inigo Jones. Some female spirits of place look after entire countries, such as Eire (from Eriu) and Britannia. They are often shown seated and bearing a bowl, cauldron or horn of plenty with which they nurture the earth. It’s an image which recurs in the Middle Ages as Grammatica. 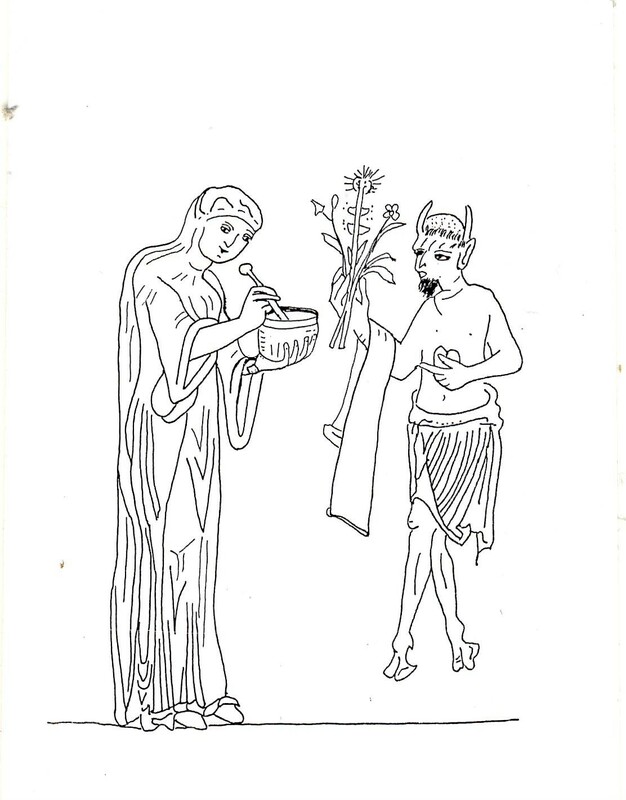 Grammatica with her medicine bowl, and a faun bearing herbs in one hand and his heart in the other. Himself asked me recently, ‘What constitutes place?’ Such a good question for which I have no answer. At the time we were sitting on our plot on the allotments in the middle of Wolvercote Common which is within Port Meadow, itself a part of Oxford, and so on until you get to the Milky Way, the Universe, etc. We decided that there is no genius of the allotments (unless you count Paddy, the top gardener and envy of us all) but plenty of elementals, as well as Spirit Animals: Buzzard, Kestrel, Betty the Blackbird, Vole and Fox, presumably lots of fairies such as Mustard Seed, Cobweb, Weed Weaver and Bee the Bumble, if only we had the eyes to see, and then that stalker of nightmares, the Squitch. Wolvercote, and, indeed, Oxford, is a very watery place, water meadow in fact, bounded on one side by the great Tamessa himself (whose holy source is not so far away) but perhaps our nearest sacred spot, other than the Holy Well of Frideswide at Binsey, is the hidden lake near the railway line. Was it once a mere or pool where depositions were made, an honouring of the waters by people who understood their dependence on spirits and elements? Their sense of sacrifice and gratitude seems utterly lost today. But let me not get on to fracking. Thanks to Jeremy Naydler for his drawing of Grammatica from a 12th c. manuscript fragment.